I spent a very lovely Sunday morning in the streets of Paris for the Traversée, where hundreds of classic (and very Oppo) cars get together to drive through the city! The thing is, Paris doesn’t really like cars. Here, cars before 1997 (excluding collectible cars) are barred from entering the capital at all, a measure that will soon be extended to more recent cars. Cars are now banned from many streets in Paris, with the Mayor of the city, Anne Hidalgo, making the war against cars one of her most ardent (and publicized) fights. And if there is some growing discontent from people commuting to Paris from outside its walls, Parisians themselves seem pretty happy to see these smelly, noisy, and cumbersome vehicles gone from their streets. That’s why events like the Traversée de Paris or even Le Mans Classic are always a revelation to me. Because while Parisians have for a long time agreed that cars are rarely more than an inconvenience, while the Yellow Vests movement, with motoring issues right at the center of it, continues to divide, there is one thing that everyone seems to agree on: classic cars are awesome. You could clearly see it during last weekend’s Traversée de Paris: tourists and Parisians alike stopping on their way to their favorite croissants to look at those old, noisy, smelly and beautiful metal boxes making their way through the cold streets of Paris. Cyclists following the whole thing just to look at more cars, kids smiling from ear to ear at the sight of a Traction Avant, people reminiscing in front of an old Peugeot, phones rocketing out of pockets at the sound of an F40 making its way to the Invalides, people happy to see a traffic jam on the top of Montmartre... We all have our reasons to like classic cars. For me, and I suspect many others participating in the event, the idea of rummaging through one of the most beautiful cities on the planet in the middle of so many amazing cars was just too good to resist. We all met up at 7:30am in Vincennes, in front of a chateau in the outskirts of Paris. It was as cold and damp as you’d expect from a January night here, but everyone seemed to be beaming with joy. A warm cup of coffee shared between friends probably helped. We then set sails towards the first stop on our trip, Montmartre. It was still dark and the streets were completely empty, save from some brave souls setting up the many markets for the morning. It really felt like a transgression, a little secret escapade, shared with 513 other cars, 78 motorcycles, 22 old tractors, 30 bikes and 4 old buses full of people. Montmartre is a tourists’ favorite in Paris, and it’s very easy to see why. The place itself l looks exactly like those Hollywood movies about France, with the small cobblestone streets, the basilica, all the small bars and shops. And then there’s the view of Paris, which is always spectacular, even in a cloudy winter morning like this one. All of it was only made better by the cars and the people that came with them. A pair of DS, a Ford Model A, a Matra Djet, and all manners of cool cars, from the budget options of various eras to the more exclusive stuff like a Facel Vega. The people were a big part of it too. This year the “theme” chosen by the organizers was comic books, and many people came dressed as characters from Tintin, others in less related but equally cool clothes. Special mention to one cyclist dressed as a WWI French soldier. That takes dedication! All of this only reinforcing the party atmosphere that made the event so special. Time to get back on the road, stop for baguettes and then meet other people in front of the Invalides, after a cool trip through historic Paris. 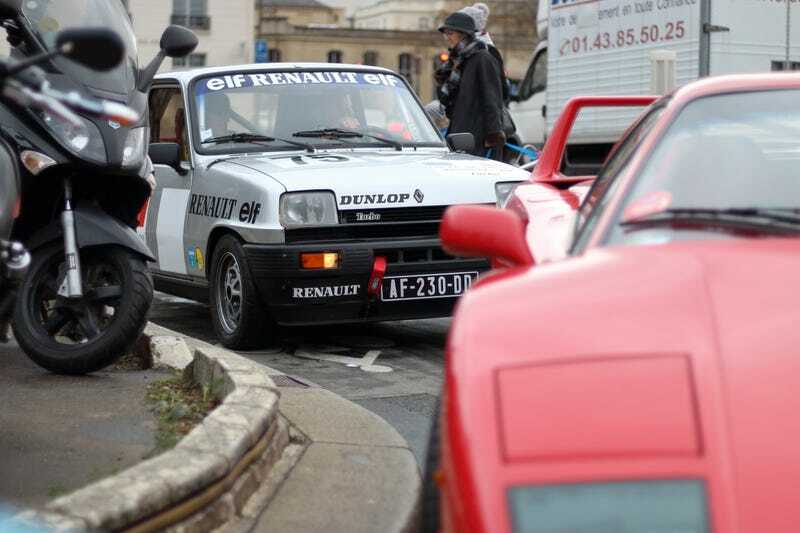 Last year, people gathered around the Place de la Concorde, where there’s room for hundreds of cars. This year, a rumored dispute with the city meant that we couldn’t park there, but instead all had to park in front of the Invalides, where there’s much less space. Oh well, I’d argue it was even more festive, because of the joyous mess created by hundreds of cars parked everywhere they could. This is the moment where you can talk with the owners, and look at the coolest cars from the event. An F40 even showed up! The variety of cars on show was quite incredible. Once again, old cars proved to be a uniting factor for so many different people. It was such a relief to see cars as a happy, cool thing that can make people come together with a smile on their face, as opposed to a divisive and flawed tool to be replaced as soon as possible.